The Post-Conference excursion will take you near the Russian border, to the surroundings of Oulanka National Park. The park represents a unique combination of northern, southern and eastern nature, which is the reason for the high species diversity of the region. The landscape is characterized by pine forests, river valleys with sandy banks and rapids, and in the north of vast mires. 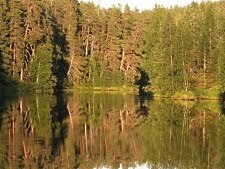 During the excursion you will see a forest restoration burning area, rich pristine peatlands typical to the region, rapids and sandy river banks of Oulanka, and hike a short stretch along on the most popular hiking routes in Finland, the Karhunkierros Hiking Trail. Besides getting familiar to the northern boreal species and landscape, an important topic during the excursion will be the past and ongoing scientific research related to restoration, species ecology and sustainable tourism in the region. 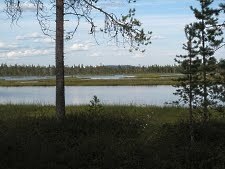 Hiidenlampi Nature Trail, 5 km/8 km, starts and ends at the Oulanka Nature Centre. The trail climbs up along the hillside through old-growth pine forests to Jäkälävaara reindeer round-up site. From the two forest ponds of Hiidenlampi you get downhill to meadows in the middle of the forest. They were abandoned over 60 years ago, but since then they have been restored to preserve meadow vegetation and as a reminder of old times. Finally the trail leads you along river Oulanka on Kiutaköngäs falls. 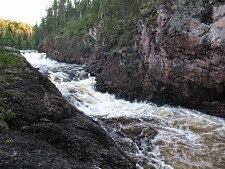 The name of the rapid is based on a Sami word for “a big waterfall in a deep gorge”. If you are lucky, you may see a wild trout jumping up the waterfall. 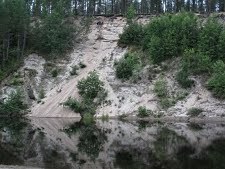 Rytisuo Nature Trail, 5 km, starts and ends at the Oulanka camping area. The Rytisuo trail is known of its rare vascular plants and mosses. Along the trail there are boreal forests with marks of old forest fires, rich fens and herb-rich forest vegetation. On the Rytisuo fen there are old barns, since the fen was earlier used as a marsh meadow, where locals made hay for their cattle. Price includes: bus tour, accommodation at Oulanka Research Station of the University of Oulu, breakfast, daily lunch or lunch package, daily dinner or dinner package (exception: only lunch during the last day), guiding, demonstrations, presentations. Walking: Daily walk 7-10 km. Several possibilities for hiking depending on the weather and interests of the group. Departure: Oulu University (straight from the Conference venue) Friday 8th August, at 14:30. Arrival back to Oulu: Monday 11th August at 13:00.